← Silly or just stupid? Despite the beliefs of economists to the contrary, Kahneman & Taversky proved convincingly that human beings were not rational when it comes to prices. This point was driven home to me again when looking at Vodka. The U.S. Government defines Vodka by code as being “without distinctive character, aroma, taste or color.” This is true no matter how many times it is distilled or who endorses it. And yet the market for ultra-premium vodka such as Grey Goose, Belvedere, etc., has grown dramatically over the last 20 years. These ultra or super-premium products and their ilk sell for $50/bottle or more. Why? If what is in the bottle is regulated by law to be tasteless an odorless, how can you get people to pay more? And that is one of the secrets of pricing. Turns out price can be a proxy for value when value is difficult to determine on its own. If you price it higher, maybe it’s worth more. But now we see a strong increase in “low-priced” premium vodkas selling for less than $20/bottle. But with cool bottles. 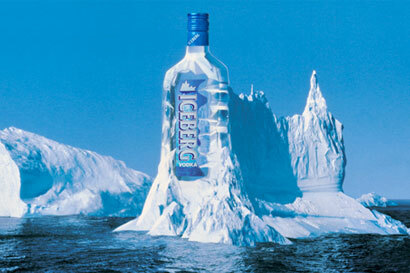 Or a back-story, like Iceberg Vodka from Newfoundland. Does this spell the end for high-priced vodka? I doubt it, but many of those so-called super-premium brands are likely to disappear as more low-cost premium brands appear. What is your pricing strategy? Is it based on costs? Based on rational thinking? Or based on customer behavior? This entry was posted in Pricing and tagged Grey Goose, Iceberg Vodka, premium pricing, price, vodka. Bookmark the permalink.